That above quote, mouthwatering in the extreme, is like an appetizer unto itself. As soon as I read it, I knew I had another dish to make. 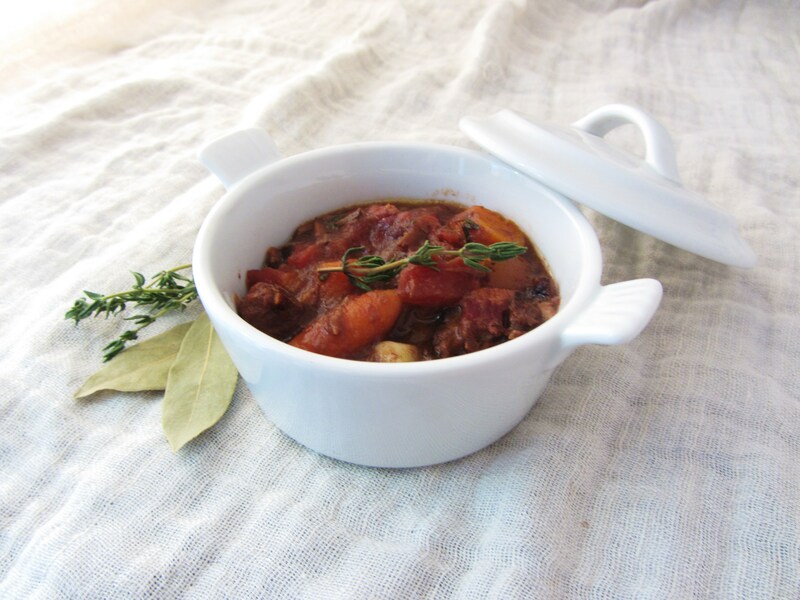 This recipe makes a wonderful, hearty beef stew that is just perfect for the coming chill of late fall and winter. The olives provide an unlooked for earthiness that is sometimes lacking in other stews, while the orange zest lightens the whole dish. The meat is meltingly tender, having been both marinated and slow cooked. The broth was not as thick as I would have liked, but a simple roux would fix that easily enough. I simmered mine most of the day in a crock pot, which gradually gave the whole house a rich, enticing aroma. I recommend pairing the stew with a nice loaf of rustic bread, some cheese, and either a hefty salad or a couple of sides, like potatoes and green beans. Marinade the beef with the herbs, shallots & garlic overnight in half of the red wine. The next day, drain the meat, pouring the wine into your stewpot or crockpot. In a large skillet, cook the bacon until it is somewhat crispy, and the fat has run from it. Remove the bacon and add to your main pot. Working in batches, add the seasoned beef to the bacon fat and cook until just browned on each side. Remove the meat to the pot, but keep the garlic and shallots cooking in the frying pan until they are soft and fragrant. Pour this mixture into the main pot, adding also the thyme, bay leaves, tomatoes, carrots, sugar, olives, zest, and remaining wine. Cook on low for at least six hours, at which point the meat should be very tender. If you like, add a splash of cognac near the end of cooking.